Erinn graduated from the University of Texas at Austin with a BBA in Marketing and a Certificate in Social Entrepreneurship and Nonprofits. Originally from Dallas, but a self-proclaimed Austinite, Erinn is passionate about social impact, Spanish, travel, tacos, and dogs. She first became involved with Well Aware as a Development Intern while studying at UT, and has been highly active in the fight for clean water ever since. 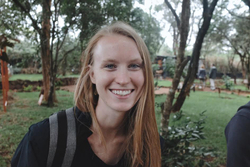 Erinn is devoted to connecting the impact of Well Aware’s work abroad to each supporter and nurturing the organization’s growth through fundraising and communications. Outside of Well Aware, Erinn can be found talking about her time studying abroad in Barcelona or singing highly off-key at live music events.